Rishikesh, also called ‘The Gateway to the Garhwal Himalayas’, is the seventh largest city in India. Located at the foothill of the Himalayas with the river Ganga flowing through it, it is one of the most common tourist attractions. Famous for its various shrines and Yoga ashrams, it is also among the few places that offer a multitude of adventure sports to its visitors. With Haridwar as its neighbor, it is also considered a ‘holy city’. The city offers a divine and serene stay, often with a twist of slight adventure. But choosing the best hotel according to your budget is of the utmost importance. Here’s a compilation of the best hotels in Rishikesh that offer a peaceful stay. If you’re planning your next adventure trip with family or friends, then this is just the place for you. Located amidst the valley, the property offers luxury beachside camps, which are equipped with all the amenities of any top-class resort along with the fun of camping. Right in the lap of nature, the resort is not only just kid friendly, but is also pet friendly. So, no more agony of leaving your furball behind. Offering a variety of adventure activities and boat rides, this is probably the best holiday destination to bond with family and friends and enjoy to the fullest. Surrounded by forest and overlooking the Ganges Valley, this tranquil spa resort is 25 km from Rajaji National Park and 30 km from Parmarth Niketan Hindu temple. Offering a variety of yogic activities and exercises, the resort is the perfect retreat for a rejuvenating and divine holiday. The luxurious spa amidst the vast lawns is sensational and will surely take you into another dimension. The peaceful and serene environment, along with top class facilities and services, it is the perfect getaway you could ask for. Set in lychee and mango orchards along the Ganges river, this serene heritage hotel is 20 km from Parmarth Niketan Ashram and 24 km from Rishikesh Railway Station. It would be absolutely correct to say that your search for peaceful hotels in Uttarakhand ends here. A peaceful bonfire on their private beach along with the blend of guitar and snacks is just what you need for your weekend getaway. Fully equipped rooms and efficient service, together provide you one of a kind stay. The location is just perfect, on the outskirt of the city to keep away the hustle bustle and provide you with a soulful and divine experience. Pretty much living up to its name, the ‘Camp AquaForest’ is located amidst dense valley and waterfall. It is a perfect camp style luxurious property that offers a variety of facilities to keep you packed throughout the day. With the best possible location, it’s in the vicinity of all the rafting and adventure sport spots. So, after a fun filled adventurous day, you can easily have a calm and peaceful stay in the camp. Planning a trip with family, or friends, or even riding solo? This is a place not to missed for sure! Looking for the perfect spot for rejuvenation and meditation? It’s right here! When in ‘the Yoga Capital’, then why not do it the right way, i.e by the riverside. Offering the various amenities and top-class services, the property provides you with luxurious rooms and rooftop dining. Extravagant lawns ornament the place amazingly and also provide you with the best place to sit and meditate, or simply read your favorite book. Along with the customary bonfire for casual gathering and recreation, they also provide a proper meeting and dining area for your outstation meetings. In the foothills of the Himalayas and overlooking the Ganges River, this high-end resort is 2 km from the Lakshman Jhula suspension bridge and 6 km from Rishikesh Railway Station. Exquisitely ornamented with gardens and pools, the property shows the perfect blend of Indian décor with a modern accent. Their luxurious spa and yoga classes will make you forget the city life stress and a dip in their infinity pool will refresh you to the core. Equipped with all the modern amenities and providing top class services, this place is perfect for a family and friends getaway. So, come and make memories to cherish for a lifetime amidst the scenic beauty of Rishikesh and alongside the Holy Ganga. Amidst the banks of river Hyule and the thick woods of Rajaji National Park, not too far from the Ganga and in the vicinity of the spiritual and adventure capital, Rishikesh, Aranyam River Retreat is the perfect place for anyone who seeks to be connected to nature and spirituality. The luxurious stay in the wilderness is just perfect for the wanderer instinct inside you, which is away from the cluttered beachside, or the grinding city noises. The offbeat activities offered there, like golf chipping and putting add a twist to this place providing an amazing experience. Rustling sound of water in the vicinity and waking up to birds’ chirping, you can actually experience all that here! Situated in the mountains, this serene resort is set along the Ganges River and lies a 7-minute walk from Camp Rapidfire. The cozy, rustic rooms, featuring the views of Ganga, are well equipped with all the amenities and top-class services. Hot tubs and sauna and spa are just what you need for a break from the monotony. Rooftop dining with jaw dropping views of the surroundings are just a cherry on the top! Situated at the confluence of Ganga and Hem River at the Himalayan foothills, Hotel Him River Resort is a great retreat for nature lovers or tranquil seekers. The property is approximately 11.5 km from Rishikesh Railway Station and 7 km from Laxman Jhula. Offering the various adventure activities like river rafting, camping, paragliding and wildlife tour to Rajaji National Park, the place offers a one of a kind experience. Offering all the modern facilities and services, the location is very camp and serene and is the perfect getaway. Get the perfect pocket friendly luxurious stay and cherish the memories for a lifetime. Amidst the heart of nature, The Mahana Resort is located facing the perennial Hyue and the adjacent hills. In this schematically designed, eco-friendly resort, experience the hills like never before. Relax and sit back at along the cozy poolside with adjoining bar for a luxurious stay. A royal service is what you get here. Equipped with the best amenities and services, enjoy the world class stay right here. Overlooking the enchanting Ganga as it meanders through the Himalayas, the hotel is built up along the foothills of the latter. At a walking distance from Famous bridge, Lakshman Jhula, enroute to the shrine of Badrinath and Kedarnath. The structure is simple, yet elegant with every room opening into a balcony for outdoor seating and swirling along the river breeze. Rejuvenate in the Ayurveda center and spa for a divine experience. It is the perfect family spot and under budget getaway. Enjoying the serene locales in and around Devsal, and hassle-free pilgrimage to Kedarnath, the property is one of a kind and offers a luxurious stay for you and your family. It offers a bird’s eye view of the Kedar Dome and a 270-degree view of the majestic, snow-capped Himalayas. Along with the scenic beauty, the resort offers a variety of top-class amenities and services to provide you with the trip stay you deserve. Following the policy of ‘adventure amidst nature’, the place offers a variety of fun and frolic activities for people of all ages. The adventure of camping blended with the luxuries of a hotel, the property offers a serene and calm atmosphere with a twist of adventure sports. Situated along the banks of Ganga, getting to the camp is in itself an experience. From rafting to trekking, the place has to offer a variety of activities which are going to leave you will one of a kind experience. Located right in the hands of nature, the resort is surrounded by lush valleys and with the river in the vicinity, it is an amazing experience altogether. Packed with all the luxuries and top-class services, the property offers the perfect blend of nature and technology. A refreshing dip in their indoor swimming pool, or a soothing yoga session, they have it all covered. Plus, they even have a conference hall for the formal meetings. An ideal place to find under-budget, calm and peaceful stay, along with all the luxuries. The pet-friendly property offers a variety of indoor and outdoor games, along with a relaxing spa. With top class services and amazing food, the hotel also offers a private conference hall/room for the meeting area. Covering both, the corporate and the family front, the offbeat location provides an exotic touch for you to experience a one of a kind stay. From homely comfort to a destination wedding or a business trip, this property is a one stop solution to all your needs. Thanks to its intelligent and effective planning, the fully content property offers a jaw dropping view of the Ganges from all the rooms. Incredible, isn’t it? That’s not all, world class amenities with the inbuilt multi cuisine restaurant, along with rejuvenating spa, yoga and ayurveda treatments, the place is packed with exciting activities and luxuries. Just a 5-hour drive away from the Capital, the V Resort is an ideal weekend getaway for the Delhiites. Located amidst the Rajaji National Park, the property offers an exotic stay amongst the beauty of the wildlife while indulging in the various adventure activities that they have to offer. And to add to that, the manicured lawns, private pools and countryside view, makes it a great base for those who are looking to escape the city’s hustle bustle. Blend of splendid comfort and grandeur at its best, nestled in the adventure capital, the property is surrounded by lush atmosphere. The Swiss Tent units offer a luxurious stay mixed with the adventure of camping. Packed with all the modern facilities and luxuries, the resort offers you a wide range of indoor, outdoor and adventure activities. Experience a fun filled stay by the river, making memories to cherish for a lifetime. Apart from being the best among the low budget hotels in Rishikesh, the property offers all the modern amenities with top class luxuries. Being the perfect blend of comfort and services, the hotel provides a tranquil stay in the adventure capital. Situated close to the airport and the railway station, the hotel is easily accessible. Want to experience hostel like homely stay, this is just the place for you. Planning a low budget hitch hiking trip with your roomies, or your partner, don’t even think twice! The low budget top class hostel provides all the modern facilities with the best food and comfortable stay. Located in the vicinity from all the major tourist spots, the pocket friendly property also offers a variety of adventure sport like rafting, bungee jumping, etc, which can be easily arranged on demand. 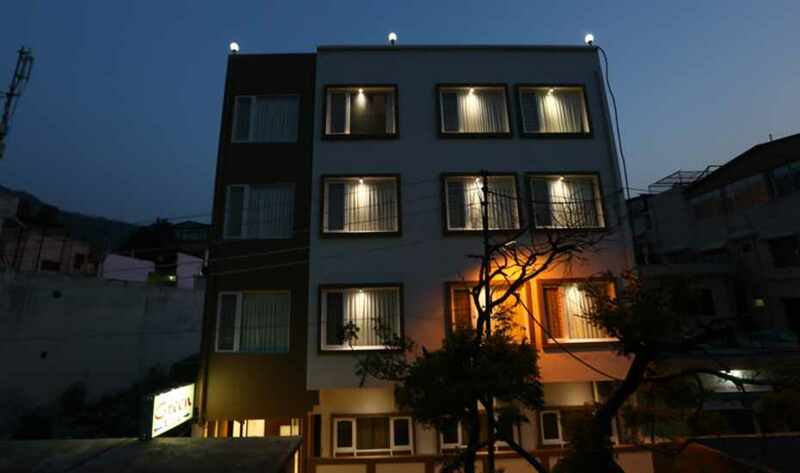 Situated right in the heart of Laxman Jhula, the guest house offers the perfect homely stay, with the comfort of a hotel. Amazing food and services provide you with one of a kind experience. Plus, it’s vicinity to the railway station makes the stay all the more convenient. It also provides bikes for hiring purposes for a complete adventure packed experience. Having a low budget, no problem! The staff caters to all your requirements and that’s all you’ll need. Nestled in the adventure hub, this guest house provides top class facilities from food to bedding, for an utmost comfortable and memorable stay. Perfect for family or individual stay, the property offers a variety of indoor and outdoor activities, along with adventure sports which can be easily arranged on demand. With Ganges in the vicinity, the guest house provides a serene and calm environment to rejuvenate you to the core. And most importantly, it’s easy on the pocket! There aren’t many pocket-friendly home stays which provide satisfactory services and a comfortable stay. On the contrary, this guest house is just perfect! Fully packed with top class amenities and best services, the property offers a homely stay for you and your fellow travelers. With the railway station right next to it, the place is easily accessible. Plus, the variety of activities offered by the guest house are enough to keep you busy throughout your stay. Amongst the top guest houses in Rishikesh, this one is not less than any other. Providing amazing food, and comfortable homely stay, the property is just right, both services and pocket wise. With the offbeat location, the house offers a serene and calm environment to get away from the city life. Moreover, the indoor and outdoor activities, including yoga sessions and ayurveda classes, are all just what you need to get relaxed to the core. This pocket-friendly home stay is packed with the best services and amenities for you to have a comfortable stay. Only low on cost, and not the quality, the property offers a variety of activities to indulge in, plus, it’s the best home stay for your friends or a couple retreat. With Laxman Jhula and rafting point, both at walking distance, explore the city without any inconvenience! What are you waiting for? Pack your bags and off you go! Explore yourself along with the city, make memories, cherish the joys that lay ahead, and more importantly, never settle. And please do share your experiences with us in the comments section. Happy holidaying!